For many people, however, today is not a happy day, but rather the most disliked day of the entire year. This is when people seem to celebrate death, the macabre, evil, darkness, the shadows, wickedness, perhaps even Satan himself. Those things are a big turn off for many people, particularly many religious and devout people who like to think about God only as Life and Light and Truth. 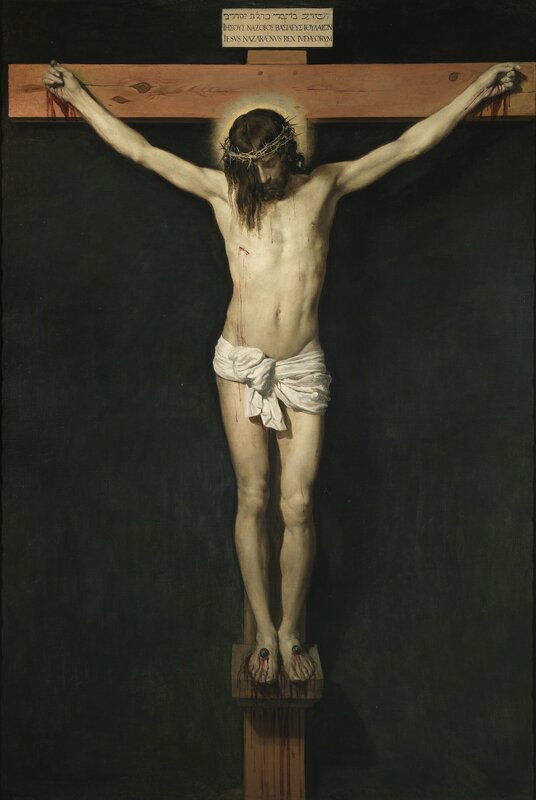 Christ Crucified (c. 1632) by Diego Velázquez. Museo del Prado, Madrid. Religion and spirituality have often dealt very closely with themes of death and dying, so we should not brush these topics off as something gross and perverse and not to be considered. Death is a natural part of life, and is an integral part of all true spiritual understanding and true religion. Often spiritual teachers will say that you must “die before you die.” What do they mean? I perceive that they mean that you must see your egoic self-identity die within you, you must see it fall away, you must “put off the natural man,” you must crucify this part of you, and see it perish. In this, you see it for what it is. You are not your ego! This self identity that you think you are, with all of your thoughts, concepts, ideas, names, knowledge, understanding, memories, and experiences. That is not you. It is a construction in your mind, what the East calls maya or “illusion.” It is not your true Self. We can catch a glimpse of this if we consider ourselves at birth. After we left the womb, we knew none of the things we do today, including our name, thoughts, ideas, understanding, memories, etc. We had none of that. And yet we were still real. What were we then, if not this “self” that we perceive ourselves to be today? Our true Self goes much deeper than our ego. Our true Self is One in God, One in the Universe. It always has been and always will be. And when the ego falls away, when this false God is taken out of its central place in our psyche, then God is revealed in Glory (2 Thess. 2:3-4 BHT). But this is a lie. When the construction of this psychological self that we carry around in our minds falls away, then we perceive the Real. Then we perceive what’s left, which is Truth. Then we see things as they really are, and not as they are colored and shaped by the constructions and judgments and filtering of our egoic mind. Then we we know, not with our intellectual mind which is part and parcel of the ego, but with our spiritual mind, with the intuitive mind, with our mind and consciousness that exists beyond and behind and transcends the logical mind that we are so used to every day. The ego thinks it knows Truth. It thinks it can contain Truth. But it never has, and never will. And so the ego dies. This, I perceive, is a major part of the symbolism of baptism, of transfiguration, of spiritual death, of Gethsemane, of suffering, of atoning sacrifice, of the crucifixion and the cross in Christianity. It is the fana or annihilation in Sufi Islam. It is the anatta or no-self experience in Buddhism. It is the moksha or liberation in Hinduism. This is the korban or sacrificial offerings in Judaism and among the ancient Israelites. These are all pointing us towards this death of the ego, of our self-identity, which is always and forever separate and independent from God. It is the cause of our Fall from God’s Presence, it seems to me. And only by being released from it, by sacrificing it, by realizing it is not our self, that we can see the face of God, and know that God is. So what happens after the ego dies? Then we perceive God with our spiritual eyes and our spiritual mind. Then our ego no longer blinds us to the Truth. Then we see Reality as it really is. Then there is no more delusion, error, sin, and suffering. And we are resurrected. The ego eventually comes back online, and we return. We are reborn, spiritually. We have seen the ego for what it is, realized that it was not who we are fundamentally, and this changes our entire reality. The world has fundamentally changed. This is the radical realization of awakening, enlightenment, salvation, exaltation, liberation, release, freedom. We are brought back to Life as Life itself. We realize that we are this Life, this Consciousness, this Awareness of our Being, even the I AM. What about our mortal bodily death? Will we “surely die”? Yes, we will. We will surely die. God and Reality are right. Even Jesus died. The ego that partook of the Tree of Knowledge and thus separated itself from the Tree of Life and the Presence of God will die. It will either happen during life, while we live, through contemplative practices such as meditation, centering prayer, and other means. Or it will happen at mortal physical death. We will surely die. The ego likes to comfort itself by thinking, “Oh, but I will continue to live! I will still progress after death. I will go on and become like the Most High in heaven!” But this is another lie of the ego, which is the father of all lies. This is our ego trying to make itself feel better about death and dying, to comfort itself. No wonder so many have seen religion as a response to humanity’s fear of death. Religion has often been just that. So many religions make one believe that the ego is what is immortal and will live forever. They often make us think that this self that we think we are will continue living for eternity. The ego has taken over many religions, unfortunately. It is what the ego likes to do. The most mystical schools in religious and spiritual and other traditions have always kept in mind the reality of humanity’s mortality. They have kept it deeply in mind. 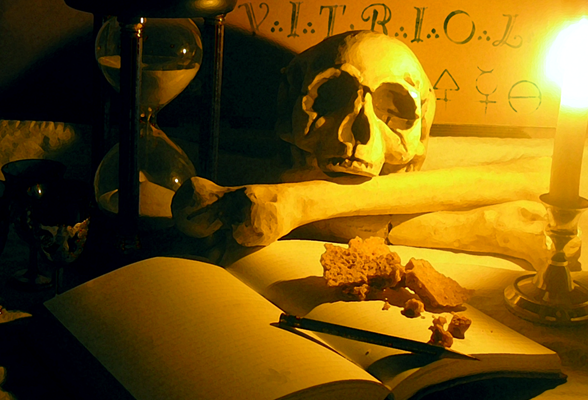 Freemasonry, for example, often uses the symbol of a skull to continually remind the self of its mortality, to help break the lie of the ego’s immortality. It is not the ego that lives forever. That is a lie of the ego. What lives forever is our true Self, which is Life, which is matter, which is energy, which is our Oneness with all things that are in the Universe. We came from the dust of the Earth (the Hebrew meaning of “Adam”), and we will return to the dust of the Earth (Genesis 3:19; Moses 4:25). This Earth and the Life upon it continues on long after our body has been laid to rest in the ground and decomposes. The elements that were once part of our bodies at death will most likely be taken up again into the bodies of new creatures, plants, animals, and perhaps even future human bodies. In fact, these elements are recycling even now, into and out of our bodies, from the Earth and back into the Earth, and we are often not even aware of it. We often think our bodies are static and unchanging, a permanent structure. But this is not so, biologically speaking. Furthermore, this ego that we think we are, I perceive, is never taken up again, and does not continue to exist anywhere, in any spirit world. This is hard to believe, I know. The ego refuses to believe it, and will come up with every excuse and explanation possible to not believe it. It will scream out loud, “I will not surely die, but I will be as the Gods!” As long as we continue to believe that, we will be held a prisoner by the delusions of our own ego, our own adversary. Many may not even want to read this blog post, because the ego tells them “No! That’s not true!” It’s too hard for the ego to read it, and we shrink. Some might ask, but haven’t spiritual teachers taught about a “spirit world,” a “spirit prison,” a “heaven” in an afterlife, an “exaltation” after this life is over? I perceive these are realities that are perceived and known and lived during our mortal life. It happens after our ego dies, not after our mortal physical biological body dies. This is ego death. This is often called the “dark night of the soul,” after the 16th century mystic Saint John of the Cross’s book by that title. This happens during mortal life, not after it. Many of the greatest spiritual figures in history have experienced this “death,” and so they knew what comes after. The reason they could tell us about what comes after this “death” is because they lived afterwards to tell us about it. I perceive that all of this darkness, death, destruction, adversary, enemy, devils, demons, evil powers, etc. that Joseph experienced all came from him experiencing the death of his own ego, his psychological self, in his own mind and consciousness. It did not come from an outside external supernatural power, entity, demonic being. He witnessed the death of his own self, the self that was in his mind. That is the moment when he saw the Light! Siddhartha Gautama also experienced this “death” during his “demonic” encounter with “Mara” just prior to his Enlightenment under the Bodhi tree, becoming the Buddha. It was even as he too “prayed” (meditated). As the about-to-be Buddha, Siddhartha Gautama, sat in meditation, Mara brought his most beautiful daughters to seduce Siddhartha. Siddhartha, however, remained in meditation. Then Mara sent vast armies of monsters to attack him. Yet Siddhartha sat still and untouched. Mara claimed that the seat of enlightenment rightfully belonged to him and not to the mortal Siddhartha. Mara’s monstrous soldiers cried out together, “I am his witness!” Mara challenged Siddhartha, who will speak for you? Then Siddhartha reached out his right hand to touch the earth, and the earth itself spoke: “I bear you witness!” Mara disappeared. And as the morning star rose in the sky, Siddhartha Gautama realized enlightenment and became a Buddha. Gautama was also “attacked” by the “powers of darkness,” in a very similar way as Joseph Smith was, just before the Light of his enlightenment. And we see this pattern again and again out throughout history, and all around the world. Often just prior to people becoming awakened or enlightened, they must first pass through “the valley of the shadow of death,” they go through some kind of tremendous existential struggle, a life crisis, deep darkness, confusion, frustration, extreme trial and tribulations, etc., wherein they realize their mortality, and that they do not have control of Reality. And Light is usually found immediately on the other side of this darkness. In the ancient literature, and even throughout the scriptures, the Light of God is often said to be just on the other side of or surrounded by darkness of some kind. This symbolism is not a mistake. Coming face-to-face with our own mortality can be deeply troubling in and of itself. If we meditate upon our mortality for some time, we may begin to feel deep sensations of fear and doubt within. We may feel it deep in our gut. This is our ego coming to know its own dissolution, which is frightful for it to consider. Ponder “I will die someday.” Consider it seriously. Meditate upon it. The Good News of the universal gospel found everywhere is that once we realize our mortality, we can then be resurrected to the Life of this life. We no longer wait for a future day when we will experience a better Life. We realize that this is it! This is the Life that I exist for, this is the Life that I’ve been waiting for! This is what I’m here for. This is the Life! I’m not here to prepare for something after I’m dead and gone. This is the main event! We come to realize that we are One with all of Life that has ever emerged on this planet, and will ever emerge on it, and throughout the Universe. We realize we are the Universe come to Life, the Universe become conscious, and we come to know this, beyond the egoic mind. This becomes our true Identity, in All that is, which is God. We perceive this directly. So, yes, “we will surely die,” in multiple ways. Don’t let your ego tempt you otherwise; it has done so since the very beginning (Genesis 3:4; Moses 4:10). Only by coming to realize this fully in this life, by allowing our ego to die and thereby seeing and knowing God, may we be resurrected to Life. We must die before we die, so we can Live while we still live. Pingback: The Godhead in the Light of Evolution – Thy Mind, O Man!